Imported Data Proximity Searches – Compare Store addresses to Customer addresses to determine groups of customers with X miles of a store. Append distance measures and demographic data for more insight. Depending on what your business is up to, these various business analysis tools can be brought to bear and will be useful in moving your business forward. Below are some general steps to take when setting up a map-based business-to-consumer market analysis, exposing the best potential growth areas for the future. The first step in the market analysis process is to consider the location-based business data you’ve got on hand and import it onto a map. Look to your accounting office for this transactional data. It should be sales data associated with an address. Viewed against a map, sales data describes your current theater of operation – it’s where you do business. Market analysis develops from an understanding of your current theater of operation. Viewing sales data on a map defines your area of operation. Is it national, regional, or local? Is it defined by states, counties, city limits or ZIP codes? Some companies understand their area of operation, others not so much, but a map view is always eye-opening. An airline’s area of operation will be defined by states or countries. Airlines could be more regional, but the business of flying doesn’t make a lot of sense at a ZIP code level. Whereas, a waste management company makes perfect sense at a geographic analysis level of city limits, ZIP codes, or counties. What is your company’s geographic base unit – ZIP code, county, or state? So, think about it. A general magazine stand, to be successful, requires a large population of people walking by. A store dedicated to male fashion magazines requires a lot of men passing by. A kiosk selling jewelry is going to want exposure to a large female audience. Know your business’s top three demographic signatures – and remain open to new ones. To properly conduct market analysis, expect to build a couple of maps. Use the first map to establish your existing theater and area of operation. Consider it a baseline map – a worksheet to develop your market analysis. Use the first map to describe your existing business geographically. Import your sales data, review various demographic categories that impact your business, and develop the extent of your area of operation. Drive time polygons are extremely helpful in developing areas of operation for B2C business maps. Drive time queries generate polygons from a central point. The polygon represents travel in all directions along a road network for a given time. Retail stores, home delivery operations, and service organizations often depend on limited drive times for customer convenience, delivery timing, and minimizing the company’s travel expenses. If drive time seems difficult to consider due to heavy commuter traffic times, or geographic obstacles like rivers, mountains or parks, consider a simple radius search instead. Sometimes a simple five-mile circle is adequate in defining an area of operation. Don’t over think this. Cover 80% of your customers. Be patient as you build your business analysis. Take the time to review a variety of area options, demographic categories, and geographic map layer options. Remember maps are an approximation; there will never be a perfect map of your business. The executive board will look for certain data layers, the sales team will want to see their own key metrics. Keep your map audience in mind. Read more about building compelling business maps in other blog posts. Remember the focus of this map is developing a baseline for further market analysis. Once you’ve got a sense of your rough area of operation, select the drive time polygon or radius search you just created and click the Binocular icon on the associated toolbar. Choose a map layer to search – usually ZIP codes – and name that Territory or area of interest. The resulting “territory” will define your realistic area of operation by ZIP code, enabling a thorough market analysis view in the Map Business Online data window. ZIP code selection based on a polygon or radius will inevitably encompass a larger area because ZIP code boundaries will overlap random polygons. Consequently, your final area of interest will include a little bit more of your imported customer locations. From the Data Window Territory view, Click More Data, in the lower right. Access imported data, and demographic data on the left panel drop down and pull those key demographic layer columns into your map analysis by moving those data columns on the left to the right. You can create summations of demographic layers and formulas out of demographic data layers using Calculated Data Columns and access those in More Data once created. Feel free to adjust your polygon to better reflect your operating area. Run your business map by a few different people in the business to get their sense of optimum coverage. Once your primary operating area map is established take note of the demographic characteristics that are associated with your most successful areas of transactional business to date. You will use these demographic categories in the next map to establish the best operating areas for expansion. You’re halfway there! In the Data Window review both the ZIP code map layer and the City Limits map layer. Use More Data to pull key demographic data categories and calculated data columns into each map layer of the analysis. Don’t overdo it. Three or four categories are plenty to analyze. I like to start with City Limits as the first pass analysis. Find the cities that make the most sense for your business. City Limits is an Additional Map Layer retrieved from the Blue Earth icon Add Map Layers button on the master toolbar. In the Data Window, select the City Limits layer and use More Data to add demographic layers by House Hold Income, Population, or a more relevant layer to your business. Filter the cities by the key demographic layer, applying a user-defined value that will return a full list of lucrative cities. For instance, filter for cities with a High-Income population of 50,000 or more. Try to filter this list down to the fifteen or twenty candidates. Tweak your filter quantities in the Data Window to adjust the returned data to your liking. Remember, demographic data varies. People in your business may expect to see Chicago on that list. If it’s not there, understand why it’s not there. Review the data and use your head. Export that City Limit layer to achieve a point layer and re-import this data using Plot Data. Use this imported data to set up a Market Analysis layer with circles around the center of each city. See video. You can use Map Business Online Market Analysis (option 1) to create up to 200 circles automatically. (Sometime in April/May 2019 drive time polys will be automated too.) 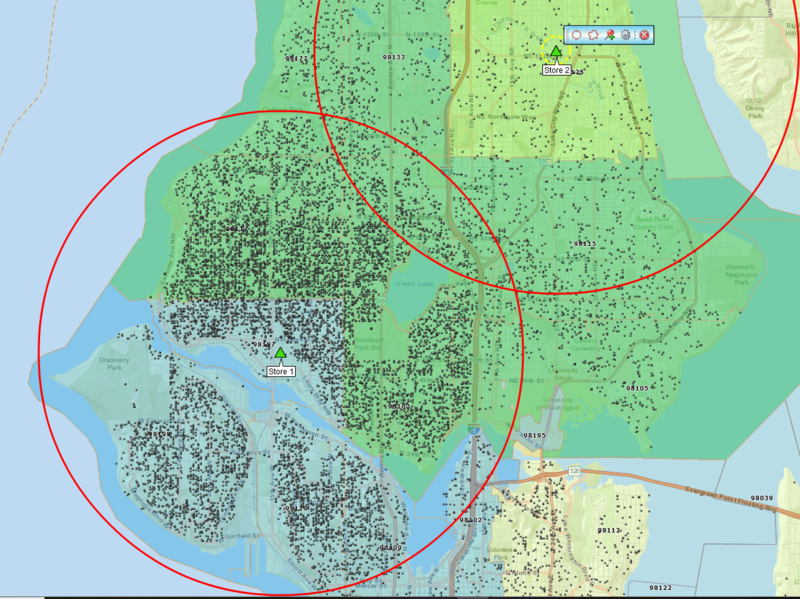 Use those inserted circles to create territories from the circle impacted ZIP codes. Pull up that first Territory in the Data Window and using your business’s critical demographic categories for the Territory Layer (pull from Demographic data or set up in Calculated Data Columns) add those layers to the territory using More Data. Now continues making ZIP Code territories in the centers of those City areas. All territories created will include the demographic data you just set up in territory one. Once you feel you created enough territories, review the demographic make-up of each area territory. Does the data make sense? Are there other categories you want to include in the analysis? Pull up the Territory Layer in the Data Window so all the territories are listed. Filter that Territory list for the most important demographic category in your analysis (in your opinion.) For example, look for all the Territories carrying a median household income level of more than $100,000. Do all cities come up with each filter few? Should they? Are there cities missing that your company has been discussing? Why are they missing? Figure it out. Don’t wait for a meeting to have the results get panned. Have you missed a key demographic category? If so, go back and fix that. Try to include an existing area of operation in your analysis for comparison purposes. Create one territory based on the location of your existing facility of facilities. Highlight it on the map. Once you’ve finished tweaking your market analysis you will want to generate an Excel report. Export the Data Window view of all the best-proposed territory areas. Map Business Online will export this data as a .CSV file. Convert it to an Excel format to match the format most of your viewers will use. In your Excel file or in an attachment include some textual content explaining your business logic in generating this report. Encourage alternative ideas and be willing to rebuild the map as necessary. Highlight your existing territory in Yellow for comparison purposes. Take time to review the report and remove data that doesn’t add value. Now present your findings to the powers that be. Good luck! This entry was posted in Business Mapping Software blog post, How to instruction and tagged expansion planning, MapPoint, market analysis, territory mapping. Bookmark the permalink.